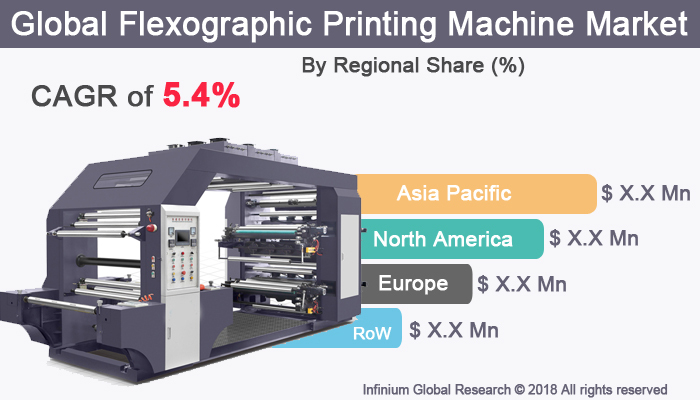 A recent report published by Infinium Global Research on flexographic printing machine market provides in-depth analysis of segments and sub-segments in the global as well as regional flexographic printing machine market. The study also highlights the impact of drivers, restraints, and macro indicators on the global and regional flexographic printing machine market over the short term as well as long term. The report is a comprehensive presentation of trends, forecast and dollar values of global flexographic printing machine market. According to the report, the global flexographic printing machine market is projected to grow at a CAGR of 5.4% over the forecast period of 2018-2024. Flexography is essentially a modern version of letterpress and is a most popular of all web-fed technologies that are expanded throughout the printing industry. Flexography is one of the most efficient and persistent printing tools that utilizes a flexible relief plate. Flexographic printing machine is used for printing on various type of substrates such as metallic films, plastic, paper, and transparent films. The flexography can print on non-porous substrates that are required for various types of food packaging. Flexible photopolymer printing plates imprint images across a wide range of surfaces that is one of the efficient method used in a flexographic press for huge volume requirements. Flexographic printing has more advantages over traditional lithographic printing presses such as high press speeds that are suited for medium to large printing jobs. Flexography includes applications such as medical packaging, food packaging, Brown corrugated boxes, and Self-adhesive labels. Furthermore, the flexographic printing machine used in common applications such as newspaper, magazines, telephone directories, business forms, and other media. Flexographic printing machine offers several advantages over traditional offset printing technology methods. Flexographic printing machine are almost used on several types of surface and has improved print quality. This printing technology offers relatively low printing cost and is easily integrated with another machine type. It uses oil-based inks as well as water-based inks, which are non-toxic, and hence finds its application in food and medical packaging. The easy plate making process enables the operator to print millions of images with one template. These factors are responsible for driving the growth in the flexographic printing machine market. Attractive packaging is one of the important elements of marketing. The packaging of a product influences the buyers’ choice to purchase the product. Thus, several product manufacturers always innovate their designs to make the packaging attractive. Moreover, on-going growth in the food & beverage, pharmaceutical, and consumer goods packaging industry acts as a major driver for the growth of this market. Besides this, technological advancements in the flexographic printing machine facilitate growth in this region. However, unstable prices of raw materials and gaining traction and capabilities of rotogravure printing machines could hamper the growth of the flexographic printing machine market. Moreover, usage of water-based flexographic ink has increased than the solvent-based inks that are providing a beneficial opportunity for the flexographic printing machine market. Geographically, the Asia Pacific region dominates the largest market share across the globe owing to Technological improvements in print quality and high press speed in the Asia Pacific region. Lower labor costs and industrial sector developments in China and India are fueling the growth of the flexographic printing machine market. Furthermore, North America is expected to hold the second largest market share followed by Europe in the global flexographic printing technology market. The Middle East and Africa region are expected to grow slowly in the flexographic machine market over the forecast period. The report on global flexographic printing machine market covers segments such as product type, technology, printable substance, application, and end user. On the basis of product type, the global flexographic printing machine market is categorized into stack press, in-line press, common impression cylinder press, and others. On the basis of technology, the global flexographic printing machine market is categorized into semi-automatic, and automatic. On the basis of printable substance, the global flexographic printing machine market is categorized into polyethylene, papers, plastics, metallic films, transparency films, corrugated cardboard, and others. On the basis of application, the global flexographic printing machine market is categorized into label, packaging, and print media & others. On the basis of the end user, the global flexographic printing machine market is categorized into pharmaceutical, consumer electronics, food & beverage, industrial, print media, shipping industry, and others. The report provides regional analysis covering geographies such as North America, Europe, Asia-Pacific, and Rest of the World. In this section, the key trends and market size for each geography are provided over the period of 2016-2024. The countries covered in the North America region include the U.S., Canada, and Mexico; while the Asia-Pacific region includes countries such as China, Japan, India, South Korea, Malaysia, and among others. Moreover, Germany, U.K., France, Spain, and Rest of Europe are the major markets included in the European region. The U.S. drives the growth in the North America region, as it is the largest market in the region. In the Asia-pacific region, rapid industrial growth in India and China offer a substantial potential for the growth in the flexographic printing machine market. As a result, the APAC region is projected to experience a growth at a CAGR of x.x% over the forecast period 2018-2024. The report provides profiles of the companies in the global flexographic printing machine market such as Nilpeter A/S, Polygraph Printing Technologies Ltd., Comexi, Palm Paper Machine, Wolverine Flexographic LLC, Aim Machintechnik Pvt. Ltd., MPS Systems B.V., Bobst Group SA, Edale UK Limited, and Mark Andy Inc. The report provides deep insights into the demand forecasts, market trends, and micro and macro indicators. In addition, this report provides insights into the factors that are driving and restraining the global flexographic printing machine market. Moreover, The IGR-Growth Matrix analysis given in the report brings an insight into the investment areas that existing or new market players can consider. The report provides insights into the market using analytical tools such as Porter's five forces analysis and DRO analysis of flexographic printing machine market. Moreover, the study highlights current market trends and provides forecast from 2018-2024. We also have highlighted future trends in the flexographic printing machine market that will affect the demand during the forecast period. Moreover, the competitive analysis given in each regional market brings an insight into the market share of the leading players. This report will help manufacturers, suppliers, and distributors of the flexographic printing machine market to understand the present and future trends in this market and formulate their strategies accordingly.